Hello there! Everyone excited it’s Thursday? It’s almost Friday! 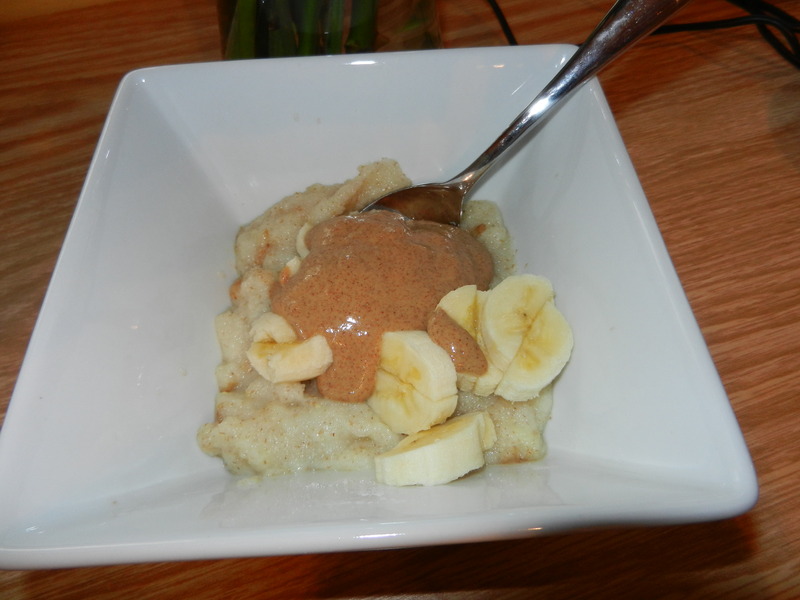 Yesterday morning started off with the usual Cream of Wheat, but this time I sweetened it with stevia, added banana slices, and Pb2 with cinnamon. Since I’ve been eating Cream of Wheat pretty much every morning, I’m trying to keep it jazzy and switch it up a bit. 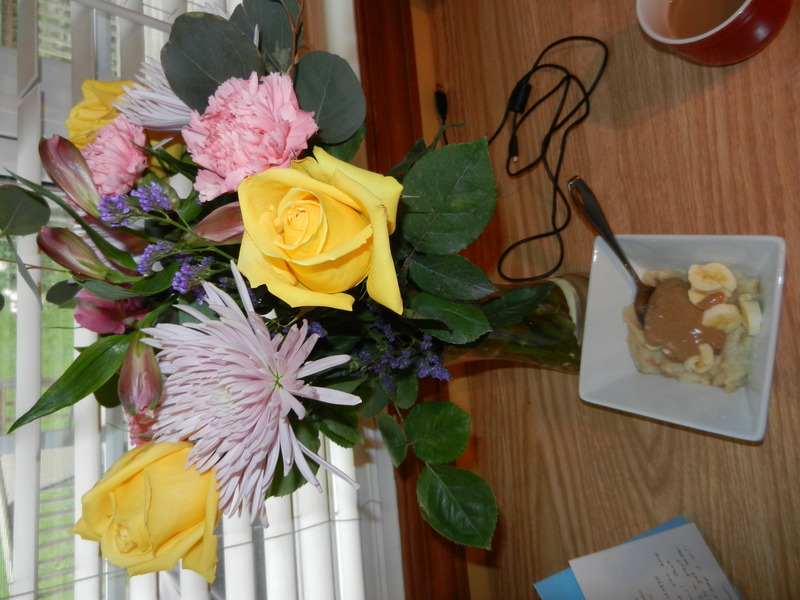 I have been noticing that I have been eating a whole lot of extra sugar (maple syrup, honey, brown sugar, fruit, etc.) lately, and I really am working on trying to cut back on it again. But I LOVE the taste of brown sugar on my Cream of Wheat, so I will be putting a little bit on there every once and a while. 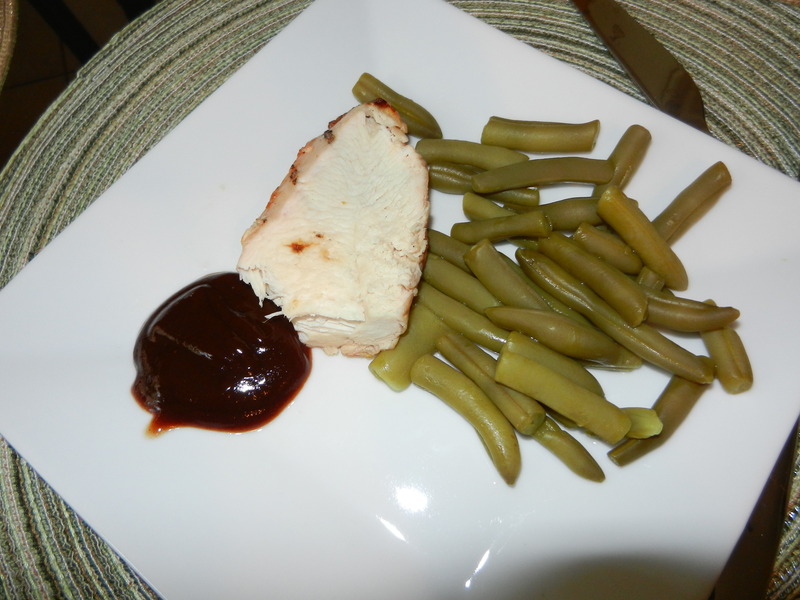 For lunch I ate a half of a grilled chicken breast with BBQ sauce and a bunch of green beans. I also ate a half of a banana with peanut butter and a no sugar added pomegranate apple sauce. Sorry for this totally unappetizing photo. After work I headed to the gym, and on the way there I snacked on fresh honeydew melon. On the workout agenda was a 20 minute warm-up on the elliptical while drooling over delicious food photos in Rachael Ray’s magazine, followed by weights where I focused on triceps and chest. On the drive home I contemplated dinner options, and decided that eggs were sounding pretty good. Should I make a frittata? I’ve never made a frittata but would really like to sometime. Should I make an omelette? Egg-white omelette? Scrambled eggs? A runny egg? 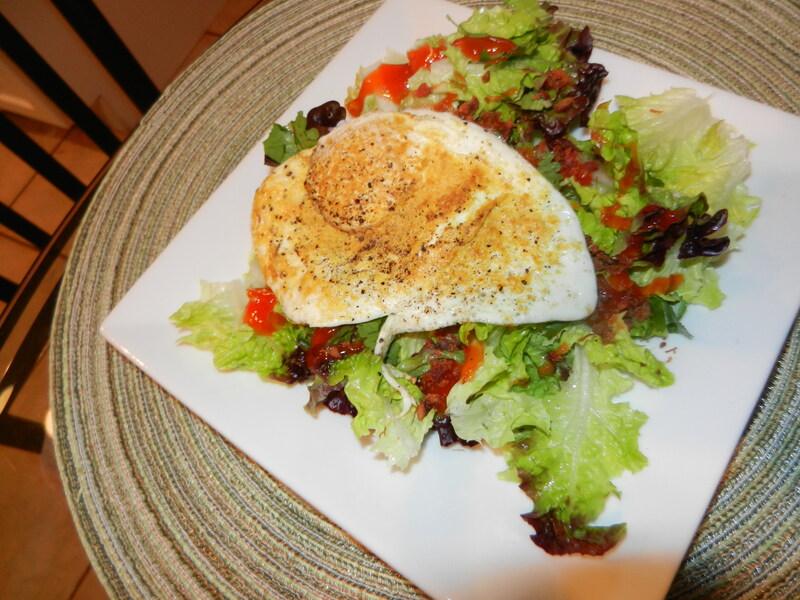 Runny egg on top of a small salad? YES please to the last option. I plated up a small green leafy salad with cilantro, bacon bits, and Western Dressing. For the egg, I cooked it over-easy and sprinkled one side of the egg with nutritional yeast and freshly cracked black pepper. I gave the egg a gentle flip towards the end of the cooking process and left it on side two for just a short time before plating it up on top of my salad. I don’t want the inside to cook through because I want runny egg. 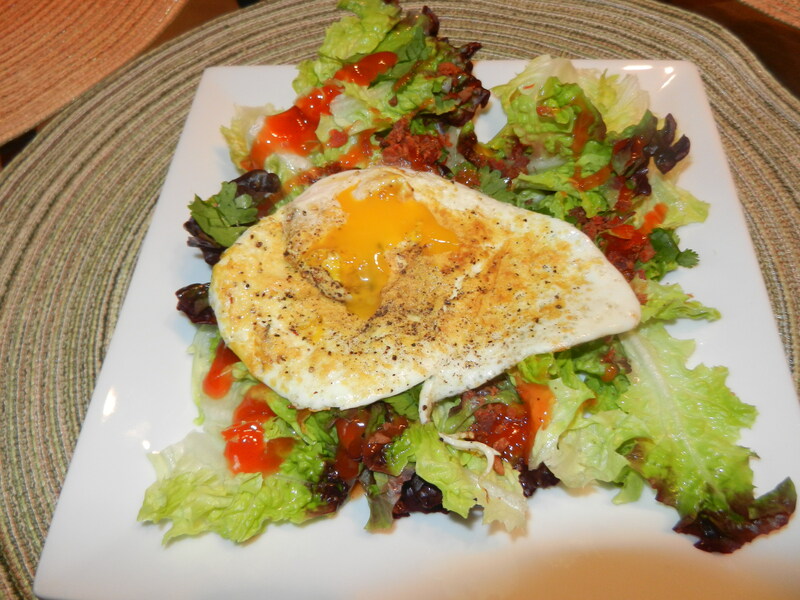 Oh, how I’ve missed you salads with a runny egg on top. So easy, and so delicious. I’ve still got to cool it on the green stuff but I am still slowly working it back in to my diet. Not yet onto the cabbage and broccoli point though. I am feeling a lot better these days and trying my best to stay positive. 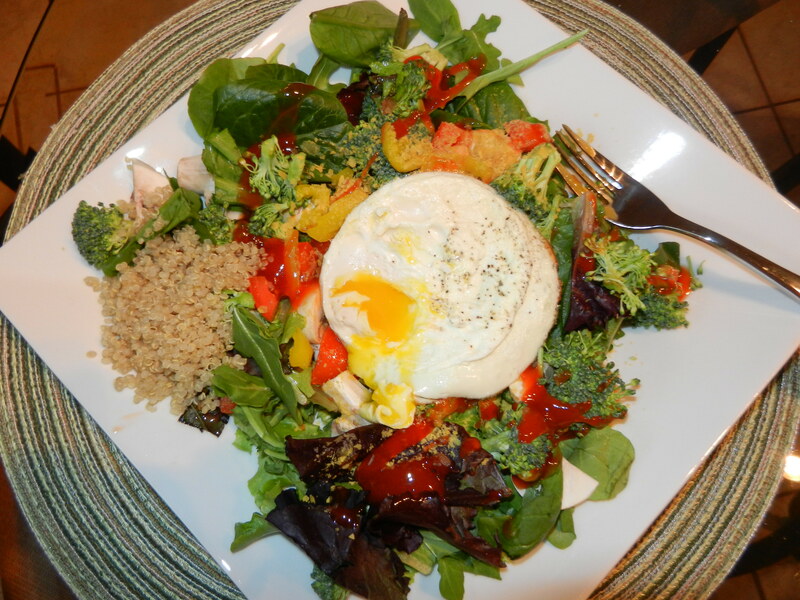 Leafy greens, broccoli, banana pepper, tomato, quinoa, and a runny egg. 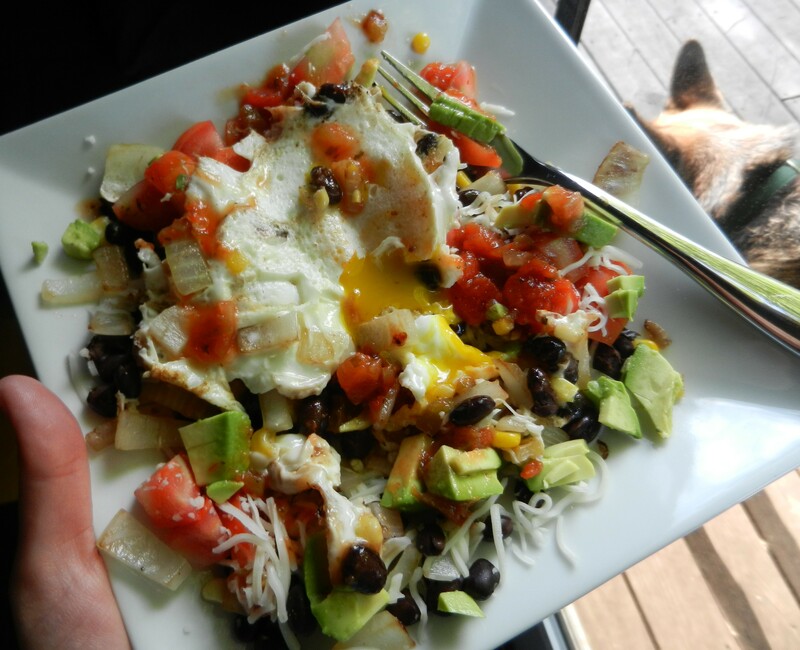 Southwestern style salad including sautéed onions, black beans, tomato, corn, avocado, cheese, salsa and a runny egg. This one was killer. 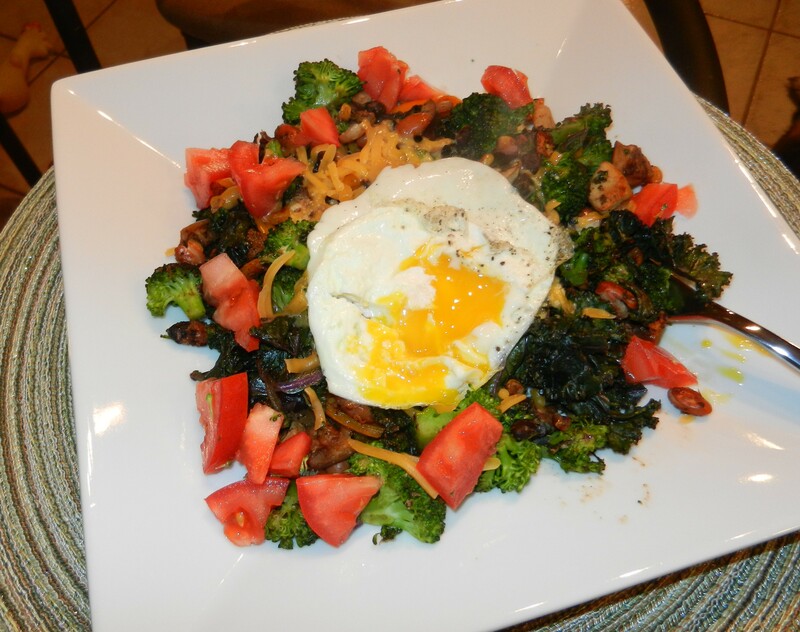 Sautéed vegetables including broccoli, kale, mushrooms, onions, black beans, tomato, cheese, and a runny egg. There are so many great ways to eat your veggies with a runny egg (or 2). I am crazy about this combo obviously. To top off dinner I ate a small bowl of non-fat Greek yogurt mixed with a little maple syrup for sweetness. After dinner, Mom and Abbie came over last night to hang out with me while Dana was out golfing. We relaxed, chatted for a while, and hung out with the pups. Always love her company. I made sure to get to bed early last night, because I was really hoping and also planning to get myself out of bed early this morning and get a run in before work. Well guess what? I actually did it! I got up before work and got a run in. Sometimes I think all it takes is me telling myself before I go to bed that I WILL be running in the morning versus saying I might run in the morning. I made sure to have all of my stuff laid out last night so that it would be as easy possible for me in the morning. I wanted to get this last run in before the race mostly to test out my outfit for the race. I know this may sound silly, but it’s so important. I may have bought a new bright pink shirt to wear for the run and wanted to make sure it wouldn’t rub me the wrong way anywhere. 🙂 Good news, no chafing. It’s a great shirt and it makes me feel good. You will get to see it in a few days. I completed 3-easy paced miles this morning and obviously feel fantastic for running in the morning before work. I feel energized. This was my last run before the half-marathon on Sunday. It’s time to rest. I have to get going and charge through my day. I hope you all have a good one! This entry was posted in Breakfast, Dinners, Lunch, Training and tagged Eggs, FAGE, PB2, peanut butter, Salads, Strength train, Workouts by Melanie. Bookmark the permalink. Good luck on your race this weekend…I hope it is everything you want it to be. Just cherish the feeling you will get when you cross the finish line and remember running is supposed to be fun, not work! I am excited to hear how your race goes!! Thank you for the great advice, Lisa. I am getting very anxious for it. I’ll be excited to report back!